People holding Cuban flags wait at the side of a road to see the convoy carrying the ashes of Cuban leader Fidel Castro at Jatibonico, Cuba, Thursday, Dec. 1, 2016. People waves Cuban flags as the ashes of Cuban leader Fidel Castro,placed in a small coffin covered by a Cuban flag, depart from the town of Santa Clara, Cuba, Thursday, Dec. 1, 2016. Castro’s remains will be saluted at every stop along the way – sometimes genuinely, sometimes grudgingly. Talk to Cubans along the route and you’ll hear an array of voices that seem to sum up a nation’s complicated feelings about el comandante. As the caravan started out Wednesday morning, thousands lined Havana’s streets shouting, “Yo Soy Fidel!” I am Fidel. Among them was a 65-year-old retired government worker named José Gamboa. It was a bittersweet moment for Gamboa. He’s a Castro loyalist – in no small part because he remembers Fidel helicoptering into Gamboa’s small town in Oriente province in 1963, when he was a boy, to help after the area was devastated by Hurricane Flora. It was something, Gamboa says, Cuban leaders had never done. Or at least on Cubans of Gamboa’s generation. Two of his children left Cuba 20 years ago to live in Miami to protest the other side of Fidel – the chronic political repression and economic crises. “They were probably part of the crowd in Miami partying when Fidel died Friday night,” says Gamboa. He rarely if ever speaks to them anymore – nor they to him. Daria Tapari outside her apartment building in Matanzas. Emotions were also divided at the caravan’s first major stop – Matanzas, 75 miles east of Havana. Waiting there was 80-year-old Dalía Tapari. With flowers in hand to toss at Fidel's ashes, Tapari stood not far from where she watched Castro pass through Matanzas on his way to Havana in 1959. That was just days after his revolution overthrew the Batista dictatorship. Back then, Tapari says she worked as a maid and lived in a shack. 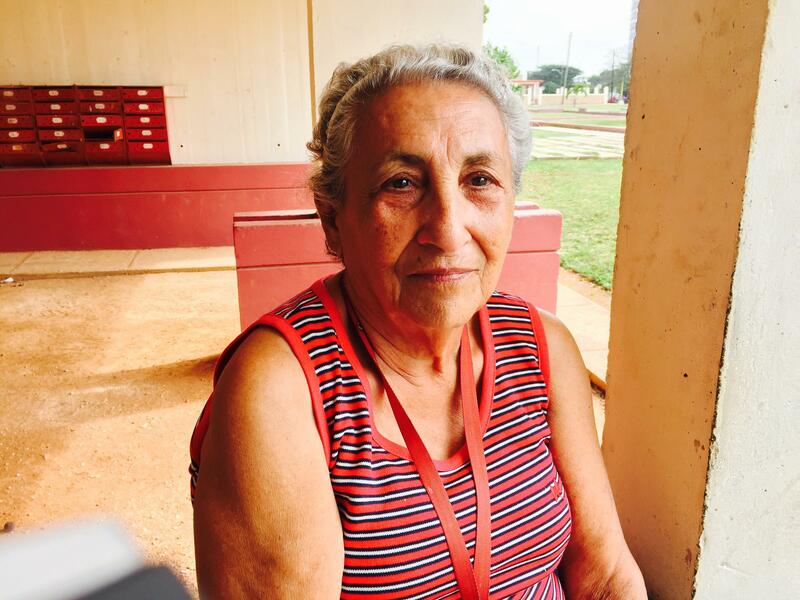 Afterward she studied to be a hairdresser, moved into an apartment building – and became a lifelong Fidel fan, despite his own dictatorship. But it’s a different story for a 34-year-old Matanzas woman who gave her name only as Aurelia, an entrepreneur who owns a sandwich shop near the caravan route. She says she barely earns enough to support her two kids. And she’s no Fidel fan. Aurelia came out to watch the caravan. But only because she feared her neighborhood Committee for the Defense of the Revolution would report her and she might lose her business license. Fidel Castro’s funeral will be held this weekend in Santiago.